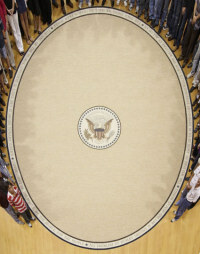 Visitor Mark A has sent me a fantastic picture of the 23 x 30-foot Obama rug for the Oval Office, created by Scott Group Custom Carpets, the same company that created previous carpets for the Oval Office, State Dining Room, and (I believe) Air Force One. I was able to straighten it out and create a simulated overhead view that is very convincing and fairly high resolution. 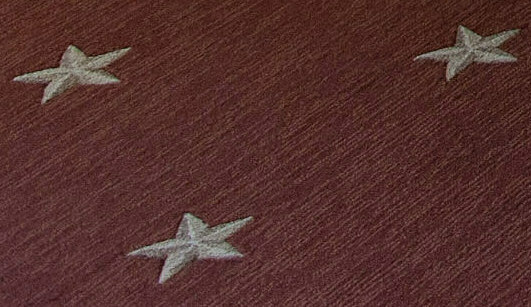 This adds to our little collection of recreations that include the Bush 2, Clinton, and Reagan rugs, but this is certainly the best of them. Thanks to Mark and special thanks to the Scott Group!